True story – While looking through client folders a few days ago, we came across a brief WordPress tutorial created for a client. We thought, “Why not share this with our readers?” Sometimes, that’s all it takes to find some content gold – and here it is: a classic case of repurposing content! Of course, the images needed to be updated for the current WordPress version, but hey… success takes work. WordPress has a convenient little dashboard that pops up as soon as you sign in. For users new to WordPress, most of what comes up is unimportant. As you get more proficient in use, however, you’ll end up with more information on your dashboard (Click the screenshot for a larger view). For SEO purposes, as well as for any “related posts” plugins, you want to keep your tags and categories as neat as possible. The WordPress navigational area is on the left-hand side of every page in the administration area. Looking at the red boxes on the image to the left, you’ll notice a little arrow. Each heading (“Posts”, “Media”, “Links”, etc.) shows this arrow when you run your mouse over it. Clicking the arrow will cause a drop down box to appear (see “Posts”). Note: if you just click on the heading and not the arrow, WordPress will take you to the main administration page for that area. We’re often asked about the difference between posts and pages. A page is sticky; it’s linked in the menu or in some other manner. 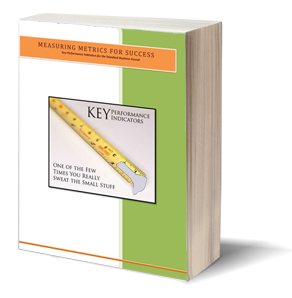 Normally, pages are used when you have information you always want available to visitors. As an example, a page might be “About”. A post, on the other hand, isn’t linked through the navigation. Posts show up in archives and categories. They’re stacked, one on top of the other on the blog’s home page (see our home page for an example). Because they’re stacked, they can quickly get buried under newer posts. Most want to be able to add pages, posts, images and other media. 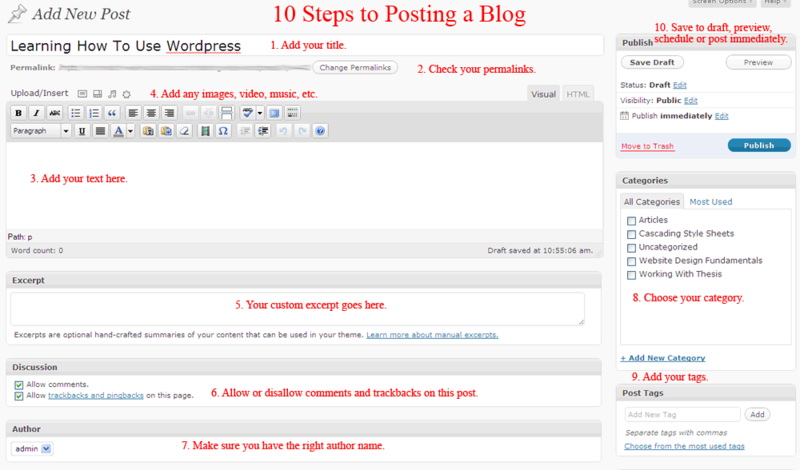 You can do all of this from the “Posts” or “Pages” administration area. Since they look the same and work (mostly) the same way, we’ll use the “Posts” area for the walkthrough. Click on “Posts” and go to the main administration page. You’ll see a list of your current posts and drafts, who wrote them, what category they’re in, and what tags you’ve used to describe them. Click on “add new”, which will take you to the posting area. Note: Your title also becomes your URL (if you have pretty permalinks turned on). Creating pages is done much the same way as posts, with one major difference. The page attributes can be found either on the right side of the dashboard or below the area where you enter your blog (depending on how your dashboard is set up). 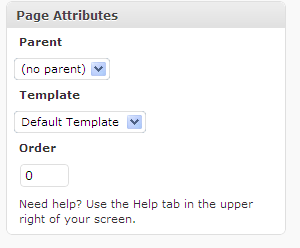 The Parent attribute is for a series of pages. For example, if you offer workshops in different cities, you might have “Workshops” in your main menu. By adding a page for “Chicago” under the Parent “Workshops”, a dropdown will show the link to the “Chicago” page. If your theme offers different templates (example: “sidebars” and “nosidebars”), the “Template” attribute allows you to select which one you want for the specific page. “Order” is another menu item. Normally, WordPress sets the order of your navigation menu alphabetically. However, maybe you want “Services” to come before “About”. In this case, you would set “Services” to the #2, and “About” to #3 (Home takes the #1 spot). Click on “Appearance” in the WordPress navigation bar. 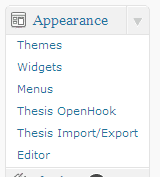 If you don’t have the Thesis Theme or the Thesis Openhook plugin, these options will not be available to you. Click on “Themes”, which will take you to the Themes main administration page. Click the “Change Theme” button and you’ll be taken to the theme dashboard. Manage Themes (# 1 in screenshot below) allows you to choose between themes you’ve already installed. 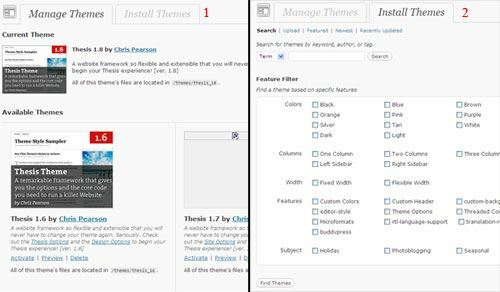 Install Themes (# 2 in screenshot below) allows you to search for new themes based on your set criteria, choose and then install all from one page. 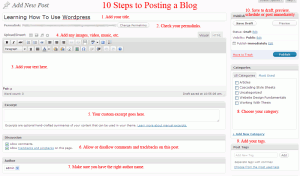 Obviously, many more functions are available in WordPress than one article can cover, but this should give you a basic overview of how to use your WordPress blog. Many people have the wrong idea about WordPress. They think it’s just for blogging and that all sites built with WordPress have to look like a blog. 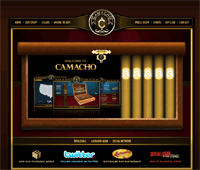 If you think all WordPress sites are alike, visit Camacho Cigars, built using the WordPress CMS. 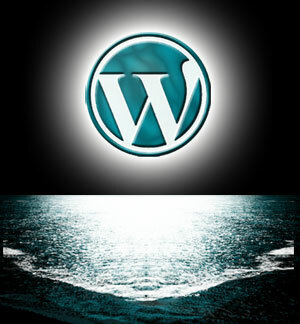 Have you used WordPress as a website or blog? What do you think of it? Has it worked well for your site? Share with our readers!